Manifesting what you want in life can sometimes seem a little challenging especially if it’s taking longer than you may have hoped for. There can be many reasons for this but the most common ones are that you’re either just not ready to receive it or you have some subconscious blocks that are in the way. Fortunately, there are easier ways to manifest than what some would have you believe. One of the keys to manifesting is the power of intention. If used properly, this power has the ability to connect your mind, body, and spirit to shape your reality that way you want it to be. So what exactly is intention? It’s a frequency of energy that is responsible for creating all things. Before anything comes into being there will always be an intention that precedes it. For example, if you want to get a haircut, then before it can happen you must first have the intention to get your hair cut. This applies to anything. Before you can lose weight, change a habit, start your own business, or ask someone out on a date, you need to set an intention. Once you set an intention, this creates an energetic frequency that your mind can focus on and your thoughts and actions can follow through with. That’s one level of intention. Another level is the one where you simply set an intention and then allow the Universe to do its manifesting magic through you. For this to work though you need to let go of trying to control it and instead work on aligning your mind and body so that you are in integrity with who you are. This means letting go of the need to control how your intention manifests in your life. It’s more about setting the intention in your mind and heart and then knowing that it already exists even if you can’t see or feel it yet. It’s being grateful for already having your deepest desires fulfilled and assuming the feeling that they already exist. The second part is to not allow what happens in the world around you to distract you from what your intentions are. Once you have them anchored in your heart and you act as if they already exist in the physical world, then you are sending a powerful message to the Universe that you are truly ready to receive. One of the big steps that need’s to happen to manifest through the power of intention is to start thinking of yourself of a spiritual being having a physical experience instead of vice versa. This then allows for your intentions to flow from a higher state of being than your human mind is capable of. The second step to take is to not let your current circumstances dictate your imagination. Imagination and intention go hand-in-hand. If you cannot imagine yourself as what you are intending to create in your life then that puts up a mental wall that needs to be overcome. Nothing in your life needs to stay the same regardless of how things are for you right now. If you are able to imagine a different version of how things could be then you are able to set an intention for that to be realized. It’s not about believing that something can change, it’s about knowing that it already has. This is how intention works. 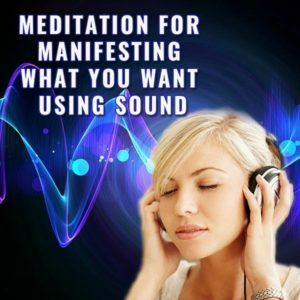 I thought I’d share this powerful guided manifesting meditation with you today by Dr. Wayne Dyer. This is a little different from what you may be used to as it involves using sound to help with higher energies to accelerate manifesting. You’ll need about 25 mins of uninterrupted time to allow yourself to really let go and move deep into meditation. Make sure you have an intention in mind before you sit or lay down to meditate as this will help with the process.